This mod is now considered final. If there is a glaring bug or glitch, you may still report it and I will try to address it, but no more content will be created. If you like this mod, please be sure to comment on and endorse it. I can't say I care much for the system, but they are really the only form of payment that I can get for this. Creating voice files and conversations from vanilla assets is a painstakingly tedious process at times, and it always helps knowing there's an audience out there that appreciates the effort I put into this mod. in the console, and wait a few seconds. Make sure you read the Installation Section and the Compatibility Concerns, and even the FAQ if you have a problem. The mod isn't difficult to set up, but there will be major issues if you fail to follow a particular step. I will not respond to ANY comments which report the resulting issue --- it should be common practice to read the readme before installing a mod, and I should not be held acountable for one's inability to do so. 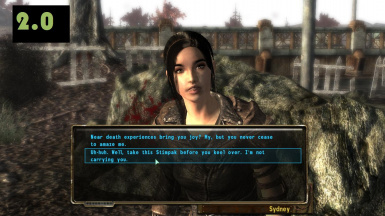 This mod allows you to recruit Sydney the Relic Hunter as a permanent companion after you finish the quest "Stealing Independence" with her in tow. She was created to be a very interactive, immersive companion that would not be demoted to the role of meatshield and would mesh into the original game with no seams showing. If you feel that to be the case (as many users have already stated in feedback), then I've done my job. - Over 420 lines of fully voiced and lip-synced dialogue, featuring the original voice cast. Not one line goes unvoiced. - Several location and quest-specific conversations and comments. 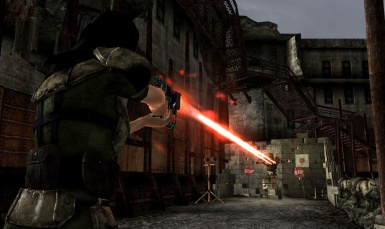 - Helpful out-of-combat abilities, including fixing up your weapons and cooking some wasteland delicacies. Both of which will improve over time. - A radio transceiver that lets you call her to catch up, establish and travel to rendezvous points, and arrange little get-togethers when she's on vacation. - The ability to give her several gifts, some of which will improve her abilities, unlock new features, or reveal new dialogue options. 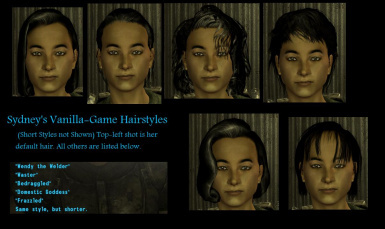 - The ability to give her haircuts by visiting various barbers in the game world. No external modding required. - Plenty of configuration options, including essential status, drug usage, weapon handling, and where she considers home. - Plus much more! A SPOILER Guide is available with the download that details most of what you can do with her. Or you can play the mod and discover everything on your own. PLEASE READ THIS SECTION CAREFULLY. IT WILL MAKE BOTH OF OUR LIVES EASIER!! 1. Extract the contents of this archive. Copy the meshes and sound folders, plus all *.esp files into (install directory)\Fallout3\Date. If it prompts you to overrite any files, do so. Nothing needs to be done with the text files or images; they are all for your convenience. A) Run FO3Masterupdate to esm-ify all of your plugins. Load "Sydney Follower.esp" near the bottom. B) Check "Sydney Follower - Load Order Fix.esp" as well, and load it at the very bottom of your list (or very close to). 4. 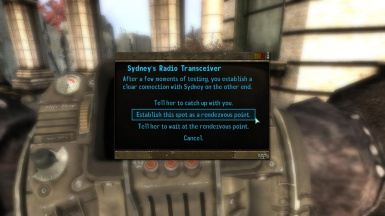 If you are using Fallout Wanderer's Edition (FWE), then please install the "Sydney Follower - FWE Fix.esp" located in the Optional Files folder. Even if you feel the need to skip over every other section of this readme, please read this. It should clear up a lot of questions and issues that you may run into. To start, this mod is obviously incompatible with any mod that modifies Sydney, including her appearance. Moving "Sydney Follower - Load Order Fix.esp" to as low in your load order as possible will ensure that my mod takes priority over others. Failure to do so will result in her refusing to follow, even though the dialogue implies she should be hired. If that's the case, check to make sure the Load Order Fix is where it should be, instead of mentioning it in the mod discussion; I won't reply to anymore posts where the user has failed to read this. It is possible to manually merge some mods, especially ones that change her appearance. For this you're on your own -- just make sure that you apply the changes to '1FollowersSydneyTemplate' instead of 'Sydney' when you're editing my mod. Changes to 'Sydney' will not register properly in game. There are some extensive changes to her original dialogue as well, but to the best of my knowledge there aren't any mods around that do this. The exception would be any mods that fix the infinite-SMG exploit -- my mod fixes that by default, so go ahead and load this lower on the list to override it. This mod should be fully compatible with follower overhauls like Phalanx (and the latest version of FOOK2 that includes it), as well as virtually every other companion mod out there. I'm a little iffy on mods like Sharing and Caring Companions, but you should be fine as long as you don't try to use SCC functions on Sydney. Note that, while she plays nicely with Phalanx, she isn't a apart of it, has her features and AI entirely separate, and it's not very likely that that will ever change. Regarding her 10mm Ultra SMG, this mod will retain full compatibility with ANY mod that modifies it, despite the new content that surrounds the weapon. And actually, I encourage you to find such a mod; it's always nice for a unique weapon to actually LOOK unique. Just... make sure that it STAYS an SMG for story reasons. Any Megaton House or Tenpenny Tower suite mod will be compatible -- any mod that lets you own both homes at once will also work without issue. However, there WILL be compatibility issues with mods that modify the exterior of both homes -- she is scripted to lean against the wall next to the door in Megaton and against a large planter just outside Tenpenny Tower's main entrance; while I am not aware of any mods that change this, I'm just giving you a heads up. Sydney can be made to recognize any custom home you download as a place to crash, as long as it's an interior. 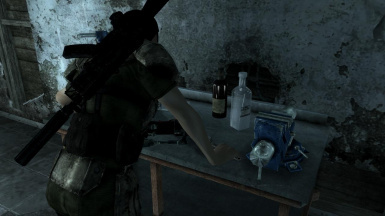 The workbench in the Citadel Laboratory has had a few static items placed on it that appear when Sydney is staying there. There is also a single marker added to the Citadel Bailey where she will practice her shooting. These should not cause issues. There *might* be an issue with the Citadel's weather, so load those mods after mine just in case. 1. 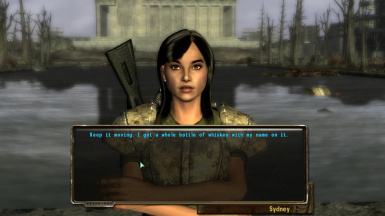 Delete the ‘Sydney Follower.esp’ and ’Sydney Follower - Load Order Fix.esp’ files from your Fallout 3\Data\ folder. 2. 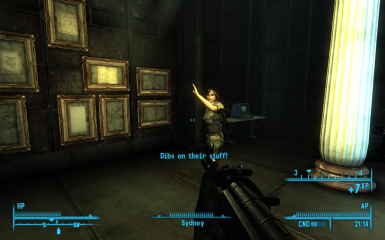 Delete the Sydney Follower.esp folder from your Fallout 3\Data\Sound\voice\ folder. 3. Miscellaneous / Requests Etc. Q: I, ERR.... SYDNEY HAD AN "ACCIDENT" AND NOW SHE'S DEAD, CAN I STILL USE YOUR MOD? A: Yes. I implemented a fix that should handle most of her pre-recruitment woes. Open the console and type "set SydneyFix.Go to 1". That will fix everything and teleport her right to you to be recruited. Please note that you MUST have finished "Stealing Independence", or the fix will not activate. Q: I FINISHED "STEALING INDEPENDENCE" AND WENT TO RECRUIT HER, BUT I CAN'T FIND HER. WHERE IS SHE? A: To be honest, I dunno. However, you can use the fix I listed about to teleport her right to you. 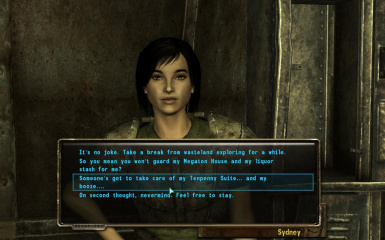 Q: I NEVER MET SYDNEY BEFORE I INSTALLED THIS MOD, AND NOW SHE'S GONE. CAN THIS BE FIXED? A: Yes, it can. See the same fix in the first question. Q: I AM ABLE TO HIRE SYDNEY, BUT AS SOON AS I TURN TO GO AWAY SHE WON'T FOLLOW ME AND JUST WALKS AWAY. HOW DO I FIX THIS? A: (facepalm) Please read the readme, particularly the part where it says to put "Sydney Follower - Load Order Fix.esp" at the bottom of your load order. You have a compatibility issue, obviously. Not that I will not respond to ANY comments regarding this complaint unless you explicitly state that you DO have the Load Order Fix in place. Q: SHE'S GONE MISSING IN MY GAME. HOW DO I FIND HER? A: The first time you try talking to her, she will give you a radio transceiver titled . This can be found in the Apparel section of your Pipboy. Equip it and choose the option to make her catch up to you. This will "teleport" her right to you, and you may proceed as normal. Q: SHE'S GOTTEN STUCK IN THE LANDSCAPE. HOW DO I FIX THIS? A: See above. Telling her to catch up on the radio will teleport her right to you, offering you a quick fix for any tricky landscape maneuvers. Note that you can hotkey the radio as well if this seems to happen often -- which hopefully it shouldn't. Q: SHE WON'T RECOGNIZE ANY BOOKS, CIGARETTES, OR OTHER CONSUMABLES I TRY TO GIVE HER. A: That means that a mod has changed the ID's of those particular items and replaced them with something else entirely. Fallout Wasteland Edition does this to accomodate some of its features. Fortunately, a modder named Zumbs was kind enough to whip up a patch. You can find this under the [Optional Files] folder of the main download. Q: SHE JUST STARTING TALKING TO ME LIKE WE JUST FINISHED "STEALING INDEPENDENCE", BUT I FINISHED THAT A WHILE BACK! A: That's intentional, actually. The mod was created with a "moments that can pass you by" premise -- if you failed to recruit Sydney right there and then, she'd move on to a different life, and what could've been is history. Unfortunately, many mod users had already finished the quest, leaving them without the chance to recruit her. I don't have the time nor desire to create an alternate recruitment path, so I just removed the block that's in place so that you can recruit her regardless of timing. Q: HELP! THIS MOD IS CAUSING PROBLEMS WITH THE [SO-AND-SO] MOD! A: If you have a compatibility issue please report it. While I've taken great pains to reduce compatibility issues to a minimum, there may be a few unforseen issues with other mods. If so, post on the mod's discussion page and I'll be happy to look into it. Do note that I'm not going to bother responding to complaints about compatibility issues with other mods that change Sydney. It should be really freakin' obvious that multiple mods affecting her are going to clash, and that's really no fault of mine. Either remove the other mod, make sure my mod is overriding the other via the Lord Order Fix, or remove my mod altogether. Your choice. Q: SHE ONLY HAS A FEW THINGS YOU CAN TALK TO HER ABOUT. I THOUGHT YOU SAID THERE WERE ALOT! A: Most of her conversations are location specific. Q: HOW DO I GET HER TO TALK ABOUT [SUCH-AND-SUCH]? A: Please read the included "SPOILER Guide.txt". It contains a list of all prerequisites for various conversations. Q: YOU SAID SHE CAN COOK. HOW DO I GET HER TO DO THIS? 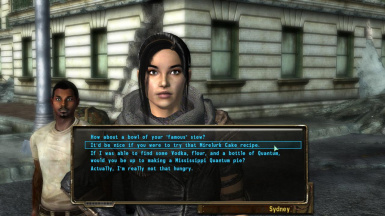 A: Acquire a generic pot and pan, then go into her dialogue. Choose "We need to talk about something" (or something to the effect, the line can change from time-to-time), and the line should appear. For obvious reasons, don't accuse her of being useless unless it's for roleplaying reasons. Q: WHAT KIND OF GIFTS CAN I GIVE SYDNEY? A: Books, mostly. Plus a few other things. Please read the "Gift" section of the included "SPOILER Guide.txt" for a full list. Q: WHY CAN'T I REMOVE SYDNEY'S ARMOR AND GUN? A: Because she doesn't trust you enough to let you strip her of her clothing and favorite gun, obviously. Build up your trust with her by interacting often and doing nice things for her; then you'll be able to remove the Combat Armor eventually. 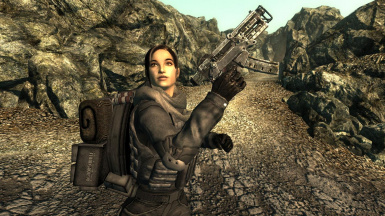 The gun requires you to complete a personal quest from the original game. See "SPOILER Guide.txt" for more info. Q: WHY DID YOU PUT [SUCH-AND-SUCH] IN THERE? I CAN'T IMAGINE SYDNEY ACTING LIKE / TALKING LIKE / DOING THAT!! A: I have tried to maintain Sydney's personality as much as I can, though I admittedly have had to compromise that a few times in order to avoid massive development woes. If there's a problem with the mod's dialogue or story that seriously gets in the way of your enjoyment, post about it (and why you think it should be changed), and I will try to take your suggestions into account. Story and character matter to me. A lot. Q: SYDNEY IS UGLY. PLEASE CHANGE HER FACE. 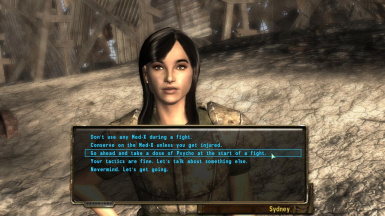 A: Well, I'd have to agree with you there; her vanilla face isn't much to look at when compared to a lot of the female cosmetic and face mods flying around. However, I will not change her face, simply because that's her default look. I full-heartedly support giving her a makeover - hell, I've done it myself, but that's something you'll have to do yourself. Q: WHAT IS THAT FACE THAT YOU ARE USING IN THE SCREENSHOTS AND WHY DOESN'T SHE LOOK LIKE THAT IN MY GAME? 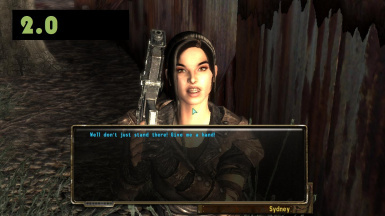 A: That is the face that was designed for Sydney in the Project Beauty mod. Because of a flaw in how Fallout 3 mods interact, these two mods WILL conflict with each other, and you'll have to patch the face manually into my mod should you want to use both. Q: WILL YOU PLEASE UPLOAD THE MOD WITH THE PROJECT BEAUTY FACE? A: No. There will NOT be a compatibility patch uploaded, as that goes against the Project Beauty author's explicit wishes. If you want to mod the face into my mod yourself, then read up on the G.E.C.K. and follow the instructions I added in the included "Editing Sydney's Looks.txt" file. A picture diagram has also been included if you want to edit JUST the face. I am truly sorry for the inconvenience. Q: I DON'T UNDERSTAND THE INSTRUCTIONS TO DO IT MYSELF! PLEASE HELP? A: PM me privately and I'll help you make sense of them. Or just post in the comments, but I'd frankly prefer PM's to reduce the clutter in the mod's discussion. Oh, and remain calm and collected about the whole thing; I am under no obligation to help anyone with changing her appearance -- I do it as a personal courtesy, and that courtesy has its limits if the other party is a shouting buffoon. Q: CAN YOU GIVE HER THE [TYPE 3 / EXNEM / etc.] BODY TYPE? A: No, I can't say I'll bother doing something like that. First and foremost being that I don't like providing body replacers on individual characters -- they take up too much unnecessary space, they might not be to the user's taste, and they might clash with any armor and clothing mods the user has installed. Besides, there's really no need; despite her custom race and clothing, they all point to vanilla meshes and textures, meaning she'll automatically take on whichever body replacer you install, so long as you have the appropriate replacement meshes for nightwear and combat armor. If you want to give her a unique body shape, you'll have to manually edit about 9 or so races to show the same results. Q: WILL YOU MAKE THIS MOD COMPATIBILITY WITH PHALANX? A: For the record, this mod is compatible with Phalanx (both the standalone and FOOK2 versions) by default since both mods will coexist without issue. What you're asking for is to "merge" the two mods, and I'm afraid that's very unlikely to happen. Phalanx is a very script intensive mod, even more so since similar scripts must be recreated over and over due to the lack of custom functions in the G.E.C.K.. While adding Sydney as she is to Phalanx would be a dream-come-true, to do it would be a huge pain in the rear, and ultimately would clash with a lot of the content I've created for her. Q: WHY CAN'T THIS MOD DO [SUCH-AND-SUCH] LIKE THAT [SO-AND-SO] FOLLOWER MOD? A: Because either I do not wish to implement that feature at this time, or I cannot due to technical concerns of one sort or another. If you have any features you'd like to see in this mod, feel free to post them. Just realize that I am about immersion, sensibility, and lore-friendliness, and I'm unlikely to add anything that can't meet that criteria. I have no intentions of turning Sydney into a glorified Barbie doll, for example, so don't expect me to integrate a bunch of hairstyle, cosmetic, and clothing mods. That said, I will consider any decent ideas thrown my way -- I've followed through on easily 90% of suggestions given so far. 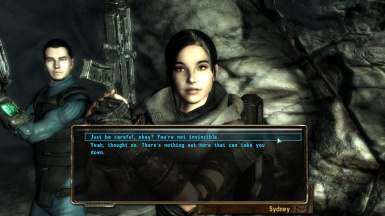 When I first played Fallout 3 on the X-Box 360, I instantly liked the character of Sydney (based on Sydney Fox from the TV show "Relic Hunter"), and thought that she was a far more interesting character than most of the vanilla followers. There was just something enjoyable about her wisecracking, tough, go-getter personality that still managed to show nuances of vulnerability through her abandonment issues and her constant desire to get drunk and shut out all of the woes of the world and its petty, selfish people who will survive at all costs. So I was pretty disappointed when she left at the end of Stealing Independence, enough so that I never completed that quest on subsequent playthroughs just so I could keep her around. 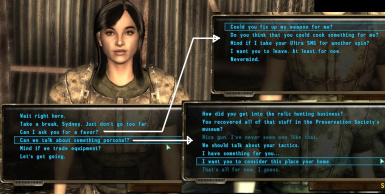 When I bought Fallout 3 for the PC, one of the first things that sprang to mind for a mod was the ability to convince her to stay with you, at which point she would gain all of the functions of a regular follow. 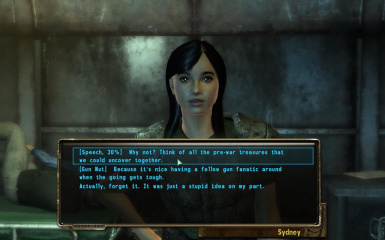 I also happen to be a dialogue lover, and one who requires voiceovers in order to maintain immersion, so I made the effort to not only achieve that original goal, but to flesh her out with additional conversations and abilities, so that she wouldn't just be the kind of companion whose backstory gets burned out and then is reduced to the lowly role of meatshield. Rather, I wanted her to be the kind of follower who would have a more meaningful role to play throughout the game. Unfortunately, I have decided to discontinue work on Sydney. Due to medical and financial complications, I have been unable to find the time to continue working on her. 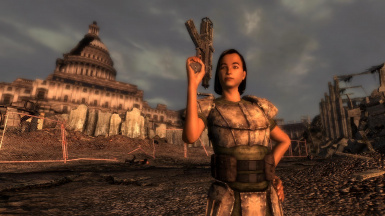 Couple that with the looming release of Fallout: New Vegas, and my interest in continuing the mod has slipped away. 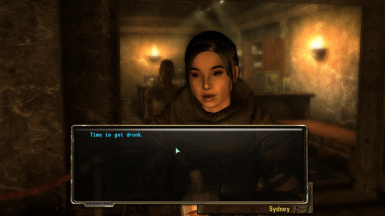 I plan to begin modding for New Vegas once I've stabilized my private and gotten the chance to play it, so if you enjoyed the work I put into Sydney, then look for me there. A big thank you to everyone who took the time to download and play with my mod. I hope that you had as much fun playing with her as I did creating the mod. issues with any future version of the mod I release. more into line of what I personally would consider a good companion. You can reach me via PM on Fallout3/Dragon Age/TES Nexus via the username "drg6525". I also go by "drg6520" on the Official Bethsoft forums, but I rarely visit there these days, so Nexus is your best bet. DRG6520 ............... For the voice splicing, scripting, dialogue, quirks, and pretty much everything else content-wise included in the mod. 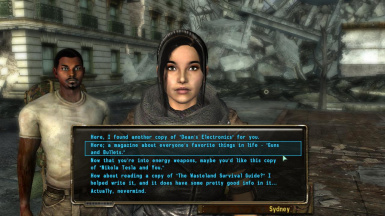 Bethesda ...............For creating Fallout 3, the all-powerful G.E.C.K., and the character of Sydney. Karen Carbone............... For voicing Sydney. 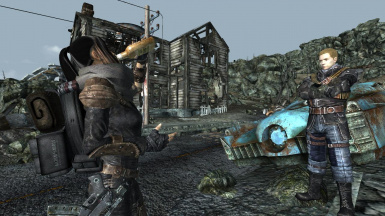 Fallout3Nexus...............For hosting this mod, and making all management and downloading of mods simple and convenient. The Mod Users............... For enjoying my work and giving me the motivation to continue improving the mod. Zumbs............... For creating a FWE patch so that Sydney's gift dialog won't break as a result. 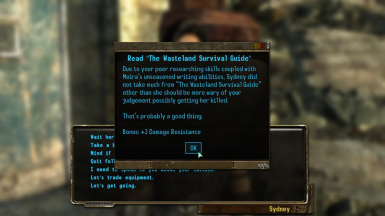 I do not claim to own Bethesda, Fallout 3, or the character of Sydney, as awesome as that would be. You may do as you like with this mod. I'm not very strict about its usage, though if you plan on copying features, spliced voice edits, or any other content from this mod I would at least like to be credited for what you used. You are NOT required to contact me for permission -- I'll say yes anyway, so just go ahead and do whatever. I won't get mad. - Do not edit the original *.esp. Activate it as a master file in the G.E.C.K. and make your changes as a separate *.esp file. Link back to the original mod as a required file. - I would prefer that only the NPC record "1SydneyHairTemplate0" is changed. "1SydneyHairTemplate1-8" can technically be changed as well, but DO NOT CHANGE THEIR RACES. - All races may be changed to reflect new hairstyles, and you may rename the Dialogue topics "2FollowersSydneyHaircut0-8" plus disable the topic "2FollowersSydneyHaircutBShorter" entirely if you choose. - Her custom armors may be changed in appearance, though I do not want the unplayable/playable flags on the outfits to change, nor the abnormally high condition HP on some of the items. - All other records in the orignal mod should NOT be touched unless you have a VERY good reason for doing so. If you want to script new items onto Sydney, please use a custom script to do so. I apologize if that all seems strict, but it's really for your own convenience. Following those guidelines will ensure that your mod remains compatibility with any version of "Sydney Follower" that I release in the future. Failure to follow those instructions can result in a need to scramble to update your mod everytime I arbitrarily churn out a new update, or cause issues with how some of Sydney's features are supposed to work.